Learning Carpets Drive Around The Park, 27" x 60" Just $13.81! Down from $29.99! You are here: Home / Great Deals / Amazon Deals / Learning Carpets Drive Around The Park, 27″ x 60″ Just $13.81! Down from $29.99! 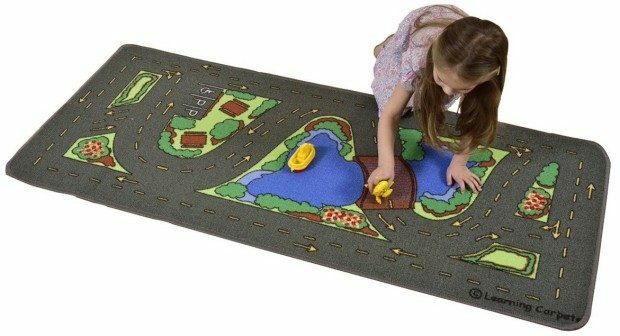 Learning Carpets Drive Around The Park, 27″ x 60″ Just $13.81! Down from $29.99! You can get this Learning Carpets Drive Around The Park, 27″ x 60″ for just $13.81 right now, down from $29.99! Our play carpet Drive Around The Park gives young imaginations a chance to test their driving skills on this beautiful park theme play carpet. The lake, the bridge, the park benches, trees, flowers and even parking spaces are all part of this fun experience. Learning Carpets, Inc. is proud to combine learning and playing in a superb line of award-winning, quality educational play carpets. Our attention to the design, details and durability translates into a lifetime of precious childhood memories. Maintaining the highest standards has resulted in our line receiving several highly regarded awards, as well as the respect of our industry. At Learning Carpets, Inc. your complete satisfaction is our number one priority.